Culture Definition: Improving Your Organization’s Culture to Grow and Innovate. In 2014, Merriam Webster named “Culture” the word of the year. Merriam-Webster chose culture by analyzing their most popular words, and which experienced the biggest spike in look-ups during the year. Why defining organizational culture is important, now more than ever. Culture definition is the starting point for any meaningful improvement in your corporate culture. The rapid pace of change demands that organizations cultivate change as a capability, not an event. Culture is the fuel source of that capability. Emerging values among younger generations are creating a movement to make the meaning and experience of work as important as results and effort. This is impacting ALL people, not just Millennials. The work contract is no longer simply “time in exchange for a paycheck.” Many smart, talented people are choosing to work for lower pay or extend their job search, rather than work for a company with no heart. A conscious effort to build a great workplace culture grounded in modern habits pays off in attracting and retaining better talent, and ensures more dedication while they work for you. The fundamental metaphor of business indicates how we view and treat people. It is not longer PC to view people as machines that can be switched on/off or measured precisely (the Industrial Age metaphor for people). Or, “human capital” – FTE numbers on a spreadsheet that produces ROI, or a cost-cutting opportunity. These metaphors and measures have value in a for-profit business. But they do nothing to tap the inherent people power and human potential in your business. The question we should be asking is: How should the conversation about corporate culture – and culture definition in your organization – be at the forefront of strategic conversations in board rooms, lunchrooms, and even home offices? Human beings need connection, purpose/meaning, freedom, and growth, to thrive. Yet, the human qualities of free-thinking, possibility-seeking, empathy, collaboration are largely stifled and under-valued in corporate environments. Ironically, efficiency and productivity outcomes are MORE possible when you build the proper structure to cultivate and harness these very qualities. Whatever you sell or deliver, it’s a good bet your marketing department is working hard to inspire and sell to your customers by tapping their innate desire for connection, purpose, meaning, freedom. And yet, most of your employees would say those qualities are not welcomed or rewarded effectively inside their company. Most of my work these days is helping leaders understand why (and how) the authentic and messy and unpredictable people stuff, is not a barrier to ROI, but a cornerstone of high performance. Learning how to befriend and harness the energy tapped through aligning people’s communication, work habits, and unique organization’s mission with your customer needs. This IS corporate culture. And, it is THE revolution in business that is key to ongoing and sustainable innovation, growth, and performance. Trying to rally the troops below them, by translating a high level “says-nothing” vision into clear priorities for their people – while VP’s and above do not act or speak with any alignment on those priorities, which seem to change monthly. In 15 years of helping leaders and companies define and evolve their organizational culture, I can say with confidence, NOW is the time to explore a meaningful definition of culture in your organization, as a basis to reinvent the way work is done and what it means. Not as this year’s initiative, but as a way to align with the growing movement that is re-shaping the fundamental contract of worker and employer. Get on the wave, or be crushed by it. Your choice. 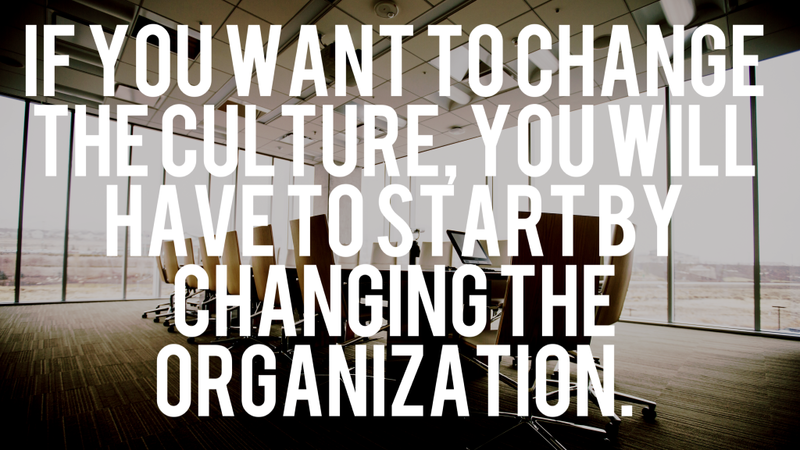 What is Organizational Culture … ? Is Culture Definition the Answer or the Question? People (of all generations, not just Millennials) are demanding an opportunity to evolve, expand, and improve the quality of their life and work. (whether they say it out loud or not, the desire grows stronger every year.) The word “culture” is the collective expression of this quest. Work largely determines the quality of our life. Your people are increasingly reluctant to sacrifice one for the other. This is not simply a demand “Leaders please fix this.” It is a collective and conscious cry: “How can we work together to shift and evolve our workplaces, from this fragile state of confusion, imbalance, constant hyper-drive? What is culture to a business? A vision that matters (more than “bigger bonuses for executives”) and is communicated frequently. Daily work that is not over-shadowed by constant bureaucratic and political minutae. Real opportunities for employees to grow in their career (even if it’s not climbing the ladder). Improving your ability to recruit talent. A stronger connection and loyalty to your organization. Greater willingness to accept ownership and responsibility. The subtle and important key is this: Do your employees believe in what you’re selling to your customers? BE the brand for your employees, that you want your customers to become loyal to… and watch the magic happen. Google – a company that is synonymous with culture, Google’s current Culture Definition challenge, is to maintain a unifying culture as they grow and spread out geographically – a quest that will require effort along with a willingness to allow sub-cultures to develop while maintaining the core spirit. REI – Culture Definition at REI is “who we hire = who we are.” With a mission to equip both customers and employees for the outdoors, to have fun and promote stewardship of the environment – hiring and empowering employees who can immerse themselves in REI’s culture IS what makes it unique. REI says its employees give “life to their purpose” and they give full credit to employees for their success. Employees can submit a proposal in the popular “challenge grants” to get equipment for an outdoor adventure they find challenging. When employees of a company are aligned with its values and are fully immersed in what the organization sells (ie, customers and employees are similar), the culture propels itself forward almost on its own. Twitter – Culture Definition at Twitter at its core is smart, dedicated people. Employees LOVE working at Twitter. Like many hi-tech companies, they offer culture perks like free meals, yoga, meetings on the roof. But more than anything, Tweeps (Twitter employees) will say “I love working with other smart people.” (The hiring theme again). Workers rave about being part of a company that is doing something that matters in the world, and there is a sense that no one leaves until the work gets done. Adobe – Adobe’s Culture Definition might be summed up as Empowerment. Adobe products are synonymous with creativity, and only through the avoidance of micromanaging are the people who create those products truly free to create. They value how Adobe’s corporate culture is consistently shaping itself to “trust employees to do their best.” Adobe does not use performance ratings to establish employee capabilities, feeling it inhibits creativity and harms how teams work. Managers take on the role of a coach, letting employees set goals and determine how they should be assessed. What is culture to a CEO, President or executive team? Why are executives increasingly concerned with corporate culture? Simple: Culture issues are impacting their bottom line. This is more than a culture definition problem. The forces of technology and globalization demand increasingly complex strategies, with more rigorous analysis and data, while you maintain the constant ability to adjust, adapt, and course-correct. This is a people-centered task: We can build a computer that analyzes the best choice in a high-risk decision. But robots will never create a movement that inspires people to camp overnight to buy the latest Apple device. In the 2015 movie Martian (in which Matt Damon plays an astronaut stranded on Mars) the character Mark Watney launches himself (Iron Man style) into space in hopes to intercept with the Captain of his mother ship (or, be cast into space forever.) The ship is a mere 63 kilometers away, yet traveling at HIGH speed. He has no steering mechanism, only the complex mathematic calculations of the team on-board the ship and the fierce intention of his Captain and himself to make it happen. Your people are like Mark Watney in your business – often feeling untethered from your company, leaders’ vision and strategies, but desiring connection. The paradox of succeeding at rapid-change-upon-change, while maintaining a stabilizing mission and connection, can only be solved by fully optimizing BOTH scientific, dedicated effort and heart. We see this in practical ways in business: Strategic planning and change management models are becoming more dynamic and responsive to the market, as are tactics to create alignment with shifting priorities and problem solving. It’s tough enough to align 10 people to constant shifts, let alone 10,000 or 100,000. Organizational culture in today’s global arena, is about combining the “smarts and heart” capability to adapt and re-align teams quickly, while maintaining the essence of harmony and connection with one another. Executives who understand this alchemy, increase the odds of success in rapid-change, high-risk conditions, when the conditions themselves are unknown and uncertain. Provide a stabilizing force in the face of constant change. Sometimes I tell my clients: “A Communication Overhaul is the primary work needed in organizations today.” Employee communication are rarely aligned with these two goals. They need to be shorter, more frequent, thematic, personal, and face-to-face. Just as communicating to your customers had to evolve, so does communicating with your internal customers – ie, employees. Your Culture Revolution: What do you choose? The rewarding but sometimes messy, complicated work of building a modern corporate culture is not possible inside the paradigm of a stressed-out, bottom-line-only world view. It takes leadership courage and focus. Neuroscience research has proven that our brain, flooded with adrenaline, does not “create” under stress. Stress triggers one thing: Take cover, or run. But most companies today run on adrenaline-fueled productivity as their default state. Changing this toxic and non-sustainable condition, means choosing the health and well-being of your people as a priority. Not only as the right thing to do (signalling a new, more human-centered metaphor for business), but as a strategy that directly impacts your ROI. As the quality of soil determines the quality of your crop, the well-being of your people will increasingly affect your growth and profit. Which means not only defining the corporate culture you want and need to attract great employees and customers, but spending time, resources, and energy building it. The revolution surrounding corporate cultures, is real and practical. Companies are filled with people wanting it, and hoping their CEO will support a redesign the human experience of work. The task ahead is making it the gold standard in every company. As with any revolution in a society, the society chooses to either reinvent itself, or the revolution reinvents you. Here’s hoping you choose to be out in front of your Culture Revolution.